Per usual, the anecdotes are a hoot from holidays with the in-laws, babies, and wedding planning to buying a house and living next to crazy neighbors. 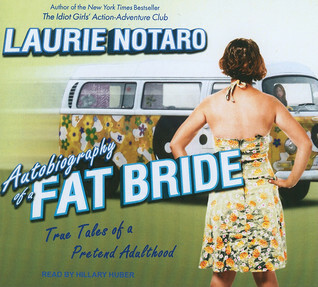 My favorite stories are the ones that include Mrs. Notaro, the woman is the breakaway star here and can rival Laurie's shine. Domestic life can be blissful as long as you have a sense of humor about its mishaps and bumps. At least that's my takeaway from this. I don't really read autobiography and all that but maybe I should try... who knows? Glad to see you still enjoying her everyday humor and life stories. Those can be fun when you can connect. Yeah it's very entertaining. I usually struggle with audiobooks in that I still need to focus similar to when holding a book. Not with this one, I multi=tasked without a hitch and still didn't miss a second of it. hahaha I'm so limited! This sounds like it was a lot of fun! Great review! this is going on my list Braine Thanks! Then you will totally get a kick out of this! OMG it's hilarious! Whoever said domesticated life is boring are in the wrong relationship obviously. Well that sounds different. Thanks for the great review. I put the first book on hold at my library after reading your review. I need more laughs. Hope you have a wonderful weekend, girl. I hope you enjoy it enough so we can be Notaro buddies! Yay for finding reads that are working for ya :) LOL on the title. That just sounds fun and I have read a lot of non-fiction this year :) May have to put this on the library list! Sounds like the humour in this gets you hooked! I'm not an autobiography reader, but this sounds great!